Pero, slave. Job, Native American. Mingow, free African. Have you heard about these men on the admissions tour? These individuals were three of at least four slave laborers who built University Hall, then called the College Edifice for the College of Rhode Island, but they aren’t often discussed. While Pero was forced to work, his owner, Henry Paget Esquire, received his pay. Paget was a wealthy merchant who used to live in an elaborate home on South Main Street where the Providence County Courthouse currently stands. The ledgers from Nicholas Brown and Co. that document their names are uncomfortable yet critical reminders of Brown’s ties to the institution of slavery. Slavery greatly contributed to New England’s economy for 150 years, yet it is often silenced in the narrative of the region’s past, as white northerners are often morally elevated and positioned in direct contrast to whites in the South. Divorcing New England from the legacies of slavery leads to a harmful erasure of blacks not only in the story of New England in the 18th century but also in present-day society. Click on this video from the University of Minnesota to learn more about historical trauma and why the past informs the present. Through the stripping of a last name, special names to make their status even more inferior than whites, and the diversion of wages, the slaves who built University Hall were deeply deprived of their personhood on many levels. This exhibition continues the conversations about Brown’s ties to the slave trade. Pick up a copy of the official report and take the opportunity to see the ledgers in person in the University Archives at the John Hay Library. 1 Prospect St. Providence, RI 02912 ~ Walk inside University Hall towards the President’s Office to view the exhibit entitled: Hidden in Plain Sight: American Slavery and the University. Maya Omori, ““To Henry Paget Esq. for 29 Days Work of Pero”,” Rhode Tour, accessed April 23, 2019, http://rhodetour.org/items/show/344. 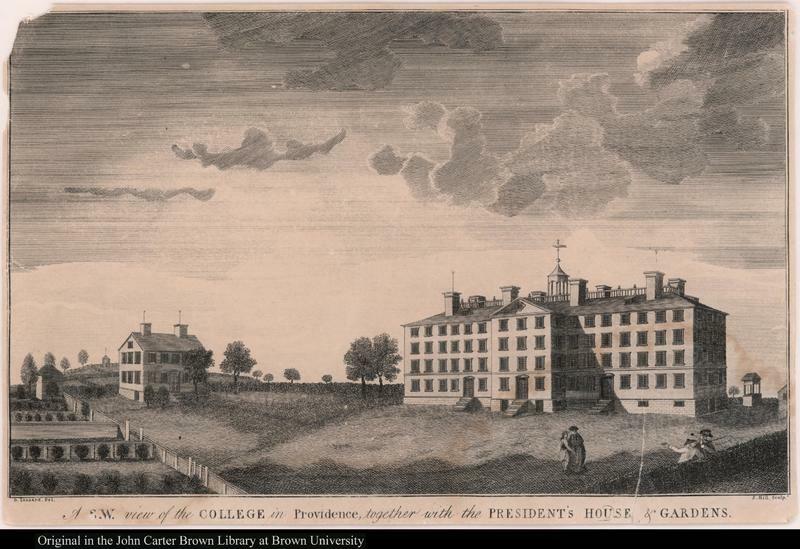 Emlen, Robert P. “Slave Labor at the College Edifice: Building Brown University’s University Hall in 1770.” The Rhode Island Historical Society 66, No. 2 (2008): 35-43. Emlen, Robert. "Picturing Brown: The First Views of the College." Images of Brown. July 30, 2012. Accessed March 20, 2019. https://library.brown.edu/cds/images_of_brown/emlen/.